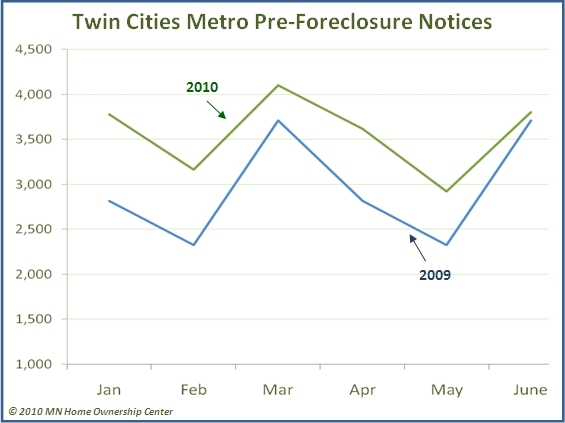 2009 had the SECOND HIGHEST foreclosure rate ever in the state of Minnesota. 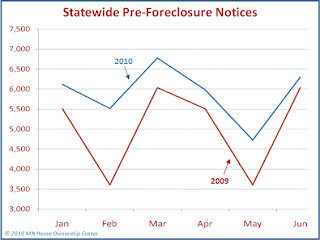 Is it possible... given the fact that the number of pre-foreclosure notices issued by lenders in 2010 is outpacing the number in 2009, that 2010 will become the second highest year on record? We welcome your opinion in the comments. 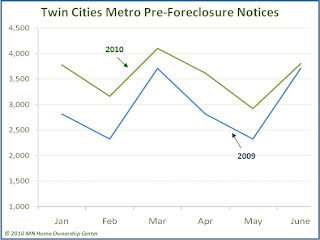 As background for new readers, Minnesota State law (MN Statute 580.021) requires that the foreclosing party provide information regarding foreclosure prevention counseling services to the mortgager (homeowner) AND provide the homeowner’s name, address, and most recent known telephone number to an approved foreclosure prevention counseling agency - BEFORE filing the notice of pendency. 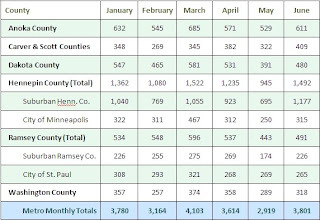 Once The Minnesota Home Ownership Center's network of foreclosure counselors receives notification from the lender/servicer/homeowners association, they then contact the homeowner, and track the number of notifications received during the month in their monthly reporting to the Center. 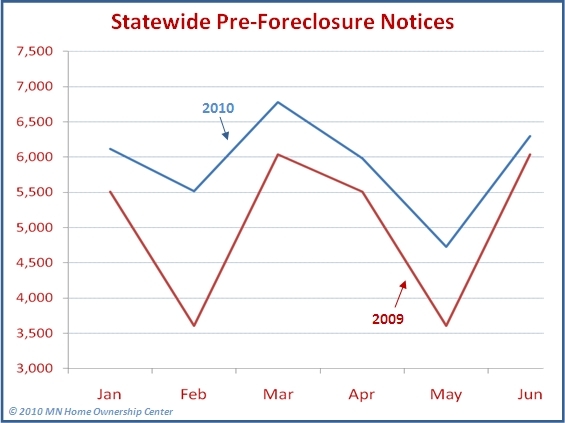 I'm wondering if mortgage foreclosure postponement notices would show up in these numbers? I would think not but have to ask anyways. If they are included, I've seen a tick up in postponements and that could account for some of the increase. 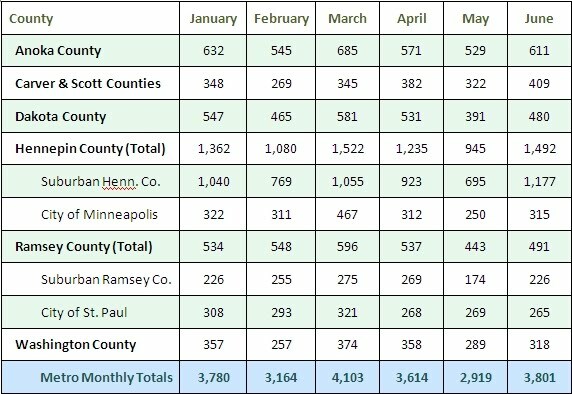 I'm surprised how closely the monthly pattern reflects the previous year. Any thoughts to why? I was shocked too by the pattern... it must have something to do with external influences... the ebb and flow of how the banks determine WHEN to proceed... and how/when they get caught up after the moratoria most of them put in place at year end (near the Holidays). It will be interesting to see if this pattern holds throughout the rest of the year.